1. The top 3 genres that I read are – Contemporary Fiction, Indian Historical Fiction and Non Fiction. I am fully aware that these genres are not represented on the Bingo Board. The main reason for this is that these books find their way into my reading list anyway; I don’t necessarily need to make them a goal. Also, some people have mentioned that I might not get the time to read my favorite genres, if I set such an ambitious goal outside of these genres. To answer that – yes, I am aware of the possibility, but I am not overly concerned. Mostly because, non-fiction is kind of covered in the picks below, and I also have a couple of Malcolm Gladwell books that are on my shelf (but not covered in Bingo), along with Jaya & My Gita by Devdutt Pattanaik, which I will certainly get to in 2016. That leaves contemporaries, and this is one genre that I am fine letting go of this year. If I am able to read some books in this genre – that’s great. If not – that’s fine too. I will just go with the flow on this one. 2. There are some categories that overlap, and I have picked the same book for them (Pride & Prejudice – as a classic* as well as ‘a book that was written over a 100 years ago’). However, in some cases, I have picked distinct books, in-spite of the overlap (Pride & Prejudice would have made the cut for Historical Romance too, but I really want to read Outlander, so there it is). Also, there are some categories where I have picked multiple books (Audiobooks – BossyPants and Yes Please). And yes, reading even a single book from that list will check off that category, but I want to have enough options. I have looked up the blurb, ratings and reviews for all of them, and that is why they made the list. So I am positive that I am going to read every single one of them. Some books that overlap might be pushed into the first half of 2017 (which is too far away to even think about; so as of now, I will hang on to my optimism), but the point is that I intend to get to all of them. Thank you – Tulika, Sreesha, Parul, Kala, Shubhangi, Inderpreet, Nidhi, Sanch, Hema & TF Carthick for all your suggestions. *I realize that Pride & Prejudice is a British Classic, but I am going with it, as I intend to read To Kill a Mockingbird anyway, and that satisfies the condition of ‘An American Classic’. I would love to hear from you guys. Have you read any of these books? Would love to hear your thoughts ( no spoilers please). If any of you have spoiler free reviews of these books, please drop a link to the review in the comments. I will be sure to check them out. P.S. Will be updating my progress all through the year on Facebook, Twitter & Instagram. P.P.S. Some of you have asked if you can re-use the Bingo image. The answer is – yes, please do (a link back would be great). Yeyyyyyy!!! My book recommendation made it to the list!!! So happy to see that. Will wait for the book review. What a cool idea. It really helps to jot down your goals and this is a great idea. Are you going to make it a calendar or a game of Snakes and Ladders? Quite a list it is.. I ll also try out some of them. Looks like I missed your note on recommendations. I am getting attracted to the Bingo. What an interesting concept! 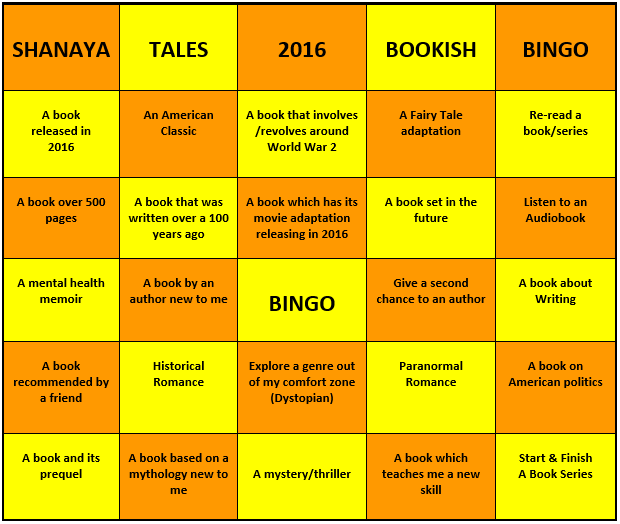 Book Bingo..never heard of it before. This year I joined in the #100bookpact but not sure if I will finish it or even be able to go halfway. But yes, I have started reading more. All the best and enjoy the Bingo! Shilpa Gupte recently posted…Little angels. How did you find both those books? You have made quite a wide range of selections there! All the best for your reading bingo 🙂 I have read Diary of a Young Girl, and of course Pride and Prejudice from the list you share. I did read some book by Dinesh D’ Souza many years ago, not the one you mention. But have no interest in reading him any more 🙂 And half of Mistry’s A Fine Balance, for some reason never completed it. Nice varied list. Don’t think I will have discipline to define a list and stick to it – will take things as they come. Oh, this is a wonderful and unique idea and list too! I tried to read Twilight and then, Robert Pattinson’s face flashed in my mind (constantly) and finally, gave up! I read Xcess Baggage by Varsha Dixit, I liked it! Recently, while experimenting with the genres, mythology came as a pleasant surprise! Loved The Palace of Illusions by Chitra Banerjee. Plan to read some more. Any recommendations in mythology? I haven’t read Twilight or seen the movie. I have heard a lot about the book though – both good and bad. As far as pedestrian writing goes, I can deal with it, as long as it is the only issue, and the story is captivating enough. Whenever I need some mindless reading (typically between heavier, denser books), I go for fluff like Twilight. P.S. I have reviewed Pradyumna on the blog. I had a couple of issues with it, but the author has told me that the book has gone through another edit afterwards, so those issues might have been fixed. Overall – it’s a decent read. Wow! !Thanks a ton for choosing my recommendations! Also I am so impressed with your dedication to the Bingo. My best wishes to you for this. With Twilight you cannot stop at the first book, you would have to read all of them, I remember there were 4 or 5 books and I read them all nonstop !! 😀 She has written another book but I could not read it..
Hard choices, I have just read a quarter but I am enjoying it. Lack of time is stopping me, I am reading her first book too – she has a strong crisp voice. I too will be reading a few of these books this year , will update you when I do. Inderpreet Kaur recently posted…This Little President: A Presidential Primer” by Joan Holub and Daniel Roode. Oh yes, I have heard that Twilight is pretty addictive. I have the books from quite some time. I am just waiting for the right time – which is between two dense books. 😛 I save the lighter reads (which I am assuming this is) for those occasions. Please do let me know if you get a chance to read any of the books I mentioned. Would be wonderful to catch up. P.S. Read your review of Go Set A Watchman. Very excited to read it next, as I am currently reading To Kill A Mockingbird. Brilliant book review. Absolutely wonderful list. All book lovers must bookmark this post…! Tessy S M recently posted…What is Crowdfunding? How to Raise Money through CF Easily and Fast? Oh Wow! What a list. I’ll share my spoiler-free reviews on FB as requested 🙂 There are few others I’ve read but not reviewed, but I like all your choices, especially The Book Thief. Not a huge fan of Twilight, cos it’s a very watered down series, loose plot. Hey for American classic, do read Gone With The Wind if you haven’t yet. Wow! What a list…there are so many books here that I haven’t read. I hope you like ‘Looking for Alaska’ that’s the only book I’ve read of John Green’s. And do read Rohinton Mistry’s ‘A Fine Balance’…one of my favourite by an Indian author. I’m sure you’ll like it. Yeah, after reading the blurb and the reviews for all his books – Looking for Alaska seemed like the best fit for me. I have read The Fault in our Stars (and reviewed it too) – I had some big issues with the book, but I do like his writing style, so thought about giving him another go. And the concept is super awesome. But I think you should think twice about reading ‘Twilight’ though. I love many books from your list. Even I plan the books that I am going to read in a year, but most of the times I dont stick as I get tempted to read something else. I am planning to read more sci-fi classics this year. Let’s see if it works out.